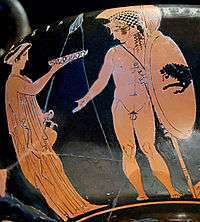 Red-figure vase painting is one of the most important styles of figural Greek vase painting. 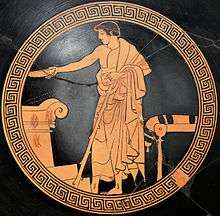 It developed in Athens around 520 BC and remained in use until the late 3rd century BC. 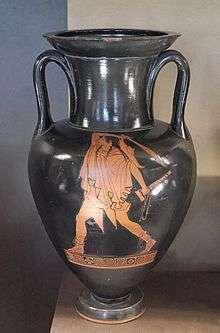 It replaced the previously dominant style of black-figure vase painting within a few decades. 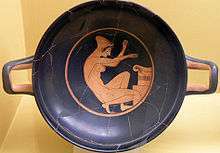 Its modern name is based on the figural depictions in red colour on a black background, in contrast to the preceding black-figure style with black figures on a red background. The most important areas of production, apart from Attica, were in Southern Italy. The style was also adopted in other parts of Greece. 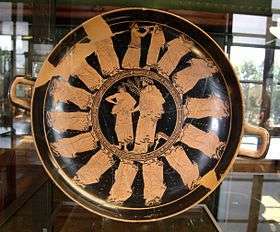 Etruria became an important centre of production outside the Greek World. Red figure is, put simply, the reverse of the black figure technique. 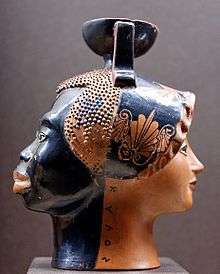 Both were achieved by using the three-phase firing technique. 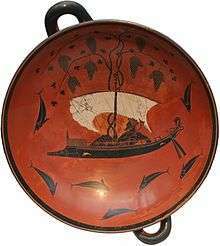 The paintings were applied to the shaped but unfired vessels after they had dried to a leathery, near-brittle texture. 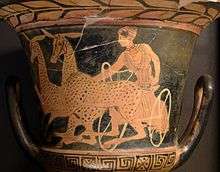 In Attica, the normal unburnt clay was of orange colour at this stage. 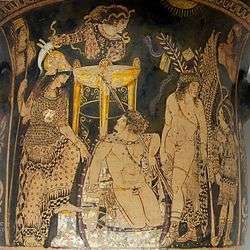 The outlines of the intended figures were drawn either with a blunt scraper, leaving a slight groove, or with charcoal, which would disappear entirely during firing. Then the contours were redrawn with a brush, using a glossy clay slip. 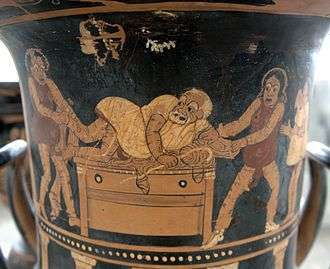 Occasionally, the painter decided to somewhat change the figural scene. In such cases the grooves from the original sketch sometimes remain visible. Important contours were often drawn with a thicker slip, leading to a slightly protruding outline (relief line); less important lines and internal details were drawn with diluted glossy clay. 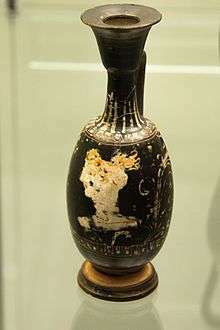 Campania also produced red-figure vases in the 5th and 4th centuries BC. The light brown clay of Campania was covered with a slip that developed a pink or red tint after firing. 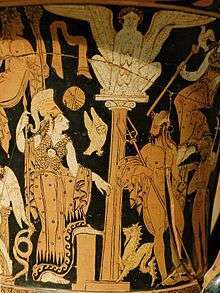 The Campanian painters preferred smaller vessel types, but also hydriai and bell kraters. 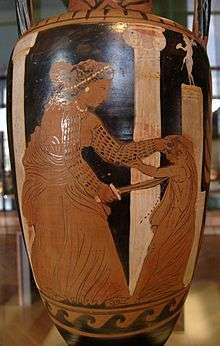 The most popular shape is the bow-handled amphora. 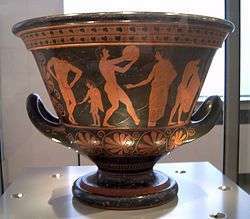 Many typical Apulian vessel shapes, like volute kraters, column kraters, loutrophoroi, rhyta and nestoris amphorae are absent, pelikes are rare. The repertoire of motifs is limited. 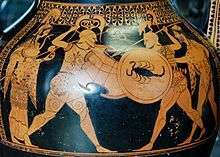 Subjects include youths, women, thiasos scenes, birds and animals, and often native warriors. The backs often show cloaked youths. Mythological scenes and depictions related to burial rites play a subsidiary role. 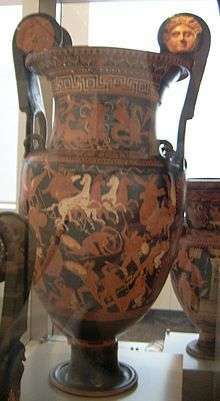 Naiskos scsnes, ornamental elements and polychromy are adopted after 340 BC under Lucanian influence. 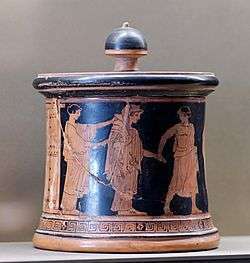 ↑ John Boardman: The History of Greek Vases, London 2001, p. 286. The hollow needle, or syringe, was proposed by Noble (1965). First publication of the hair method by Gérard Seiterle: Die Zeichentechnik in der rotfigurigen Vasenmalerei. Das Rätsel der Relieflinien. In: Antike Welt 2/1976, S. 2-9. ↑ Joseph Veach Noble: The Techniques of Painted Attic Pottery. New York 1965. The Process was first re-discovered and published by Theodor Schumann: Oberflächenverzierung in der antiken Töpferkunst. 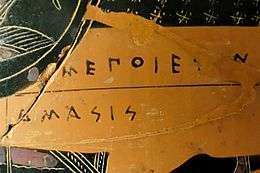 Terra sigillata und griechische Schwarzrotmalerei. In: Berichte der deutschen keramischen Gesellschaft 32 (1942), S. 408-426. More References in Noble (1965). 1 2 Ingeborg Scheibler: Vasenmaler, in: DNP 12/I, col. 1147f. 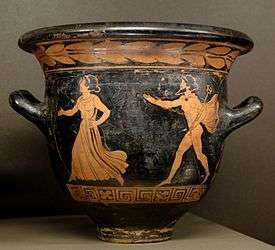 ↑ Boardman: Athenian Red Figure Vases: The Classical Period,1989 p. 237. ↑ Hurschmann: Unteritalische Vasenmalerei, in: DNP 12/1 (2002), col. 1010 and Trendall p. 9, with slightly differing numbers. ↑ Hurschmann: Apulische Vasen, in: DNP 1 (1996), col. 922f. ↑ Hurschmann: Paestanische Vasen, in: DNP 9 (2000), col. 142f. 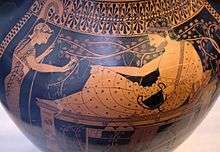 ↑ Reinhard Lullies in Antike Kunstwerke aus der Sammlung Ludwig. Vol 1. Frühe Tonsarkophage und Vasen, von Zabern, Mainz 1979, p. 178–181 ISBN 3-8053-0439-0. 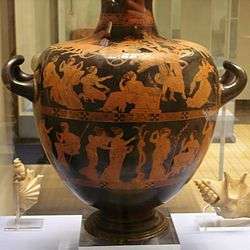 ↑ Hamilton's first collection of "Etruscan" vases was lost at sea but memorialized in engravings; he formed a second collection that is conserved in the British museum. ↑ John Boardman: Schwarzfigurige Vasen aus Athen, p. 7f. 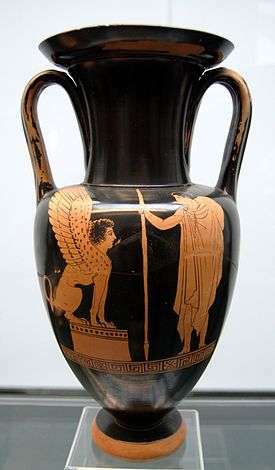 ↑ The principal exceptions being David Gill and Michael Vickers who repudiate the significance of vase painting as an art form and reject the analogy of Renaissance artists' studios and the ancient Greek pottery workshop, see Gill and Vickers Artful Crafts, 1994, also R.M. Cook Artful Crafts: A Commentary, JHS, 107, 1997 for a critique of Vickers's and Gill's thesis. Additionally James Whitely and Herbert Hoffman have criticised Beazley's approach as being unduly "positivist" in that it concentrates exclusively on aspects of connoisseurship at the cost of ignoring the larger social and cultural context that might have influence the practice of vase painting, see J. Whitley, Beazley As Theorist. Antiquity 72 (March 1998): 40-47, and H. Hoffman, In the Wake of Beazley. 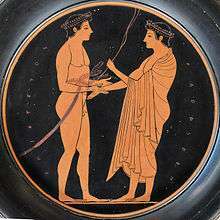 Prolegomena to an Anthropological Study of Greek Vase Painting. Hephaistos 1 (1979): 61-70.